As the world progresses, the need for bigger machines arises from giant pieces of mining equipment and flying cargo fortresses. Incredibly large moving platforms are transporting tons of equipment. We went out to find some of these legendary Giants and put together the ten biggest vehicles of all time. The ten biggest vehicles of all time. 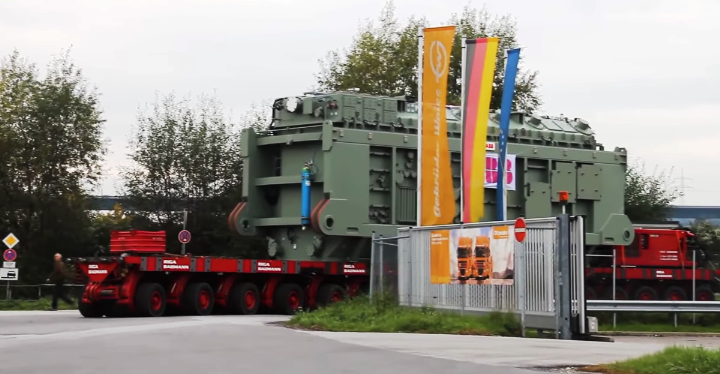 If you’ve never seen this massive earthmover before then, you would be amazed by its sheer size. The Bagger 293 is the most massive land vehicle in the world. It holds the Guinness world record. It is the latest in a series of large earth moving excavator. The German industrial company Tok Graf built it in 1995.It is a bucket-wheel excavator that stands a towering 310 feet tall and 722 feet long and weighs 14,000 200 tons. The bagger 293 digs for low-grade coal used in steam electric power plants. It has a massive 70-foot diameter wheel that spins its 181452-gallon bucket. 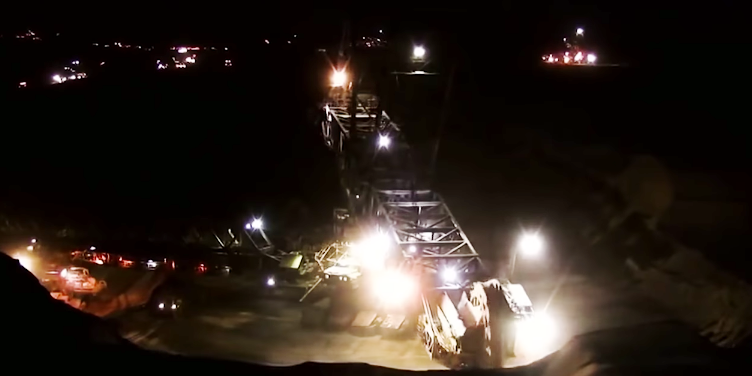 Scooping up earth that it dumps onto a conveyor belt built into its boom arm. It can move 218 thousand eight hundred eighty tons of material per day. 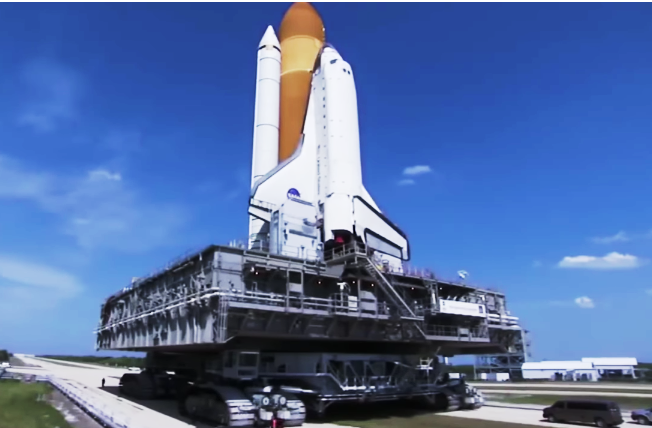 This is the biggest crawler transporter in the world it’s amazing. It was designed over 50 years ago is still the most significant track vehicles ever made. The unique crawlers features include the large tracks or treads that propel the vehicle along. There are treads – per corner, with each thread containing 57 shoes. Each shoe is 7.5 feet long and 1.5 feet wide and weighs 2,100 pounds. The height of the crawler is 6 meters or 20 feet to 8 meters or 26 feet adjustable. The top deck is flat and square, about the size of a baseball infield. 27 meters or 90 feet, on a side to operator control cabs. One at each end of the chassis is used to control all crawler systems. Almost like the NASA transporter, but utilizing rubber tires and wheels. The SPMT or self-propelled modular transporters consists of different modules with four, five, six and eight axle lines load capacity, differs per version with a maximum up to 44 tons per axle line. Each module can be fitted with its engine control, steering system. The modules can be connected side-by-side and head to tail to form large platforms on wheels. SPMTs have the possibility of 360-degree steering of the wheels. This allows carousel inside way movements. The vert deck height can hydraulically be adjusted by approximately 60 centimeters. Enable vertical lifting or lowering of the load due to their variety of combinations. SPMTs can lift and move virtually every heavy load. These large dump trucks have been in production since 1998 and our caterpillars largest and highest capacity dump trucks. Often called a haul truck. The engine in this beast has 3,400 horsepower and gets that from a 24 cylinder electronic unit injection quad single-stage turbocharged liquid after cooled four-stroke diesel engine. The cat 3 5 – 4 b HD engine is a tandem unit consisting of 2 12 cylinder engine blocks coupled to operate as a single engine. With a combined displacement of 6000 468 cubic inches. 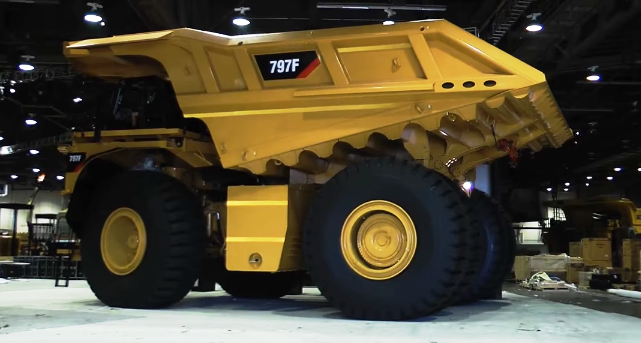 The 797 series haul trucks are equipped with a rear axle mounted computer-controlled 7-speed planetary transmission. With a separate lock-up torque converter. It has a massive 380 ton rated payload rating cost. This 5 million dollars each with the tires alone costing 42 thousand dollars each. If you want to know what the most massive haul truck in the world. Take a look at the Bellaz 75710. 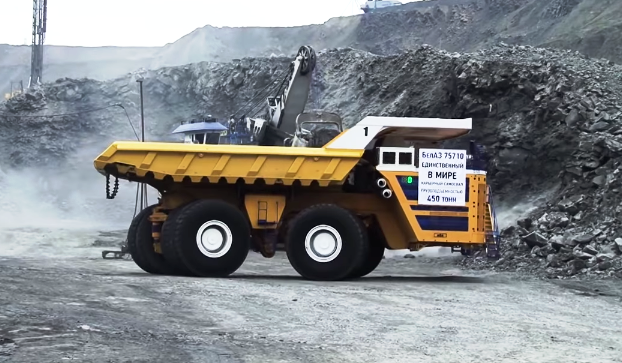 This giant earthmoving machine that was built in 2013 has a conventional two axle setup. But the wheels are double to 4 wheels per axle. It needs 859 by a TR 63 inch tires. It is so big that it utilizes a four-wheel drive four-wheel hydraulic steering system. So that it can turn. It has not one, but two 16 cylinder four-stroke diesel engines. Each with 2300 horsepower. These are coupled to AC alternators and for AC traction motors in each axle. The 757 t10 can carry a 450 metric ton payload with the empty weight of this massive hauler at 360 tons. The prelude is the world’s second floating liquefied natural gas platform as well as the world’s biggest offshore facility ever constructed. 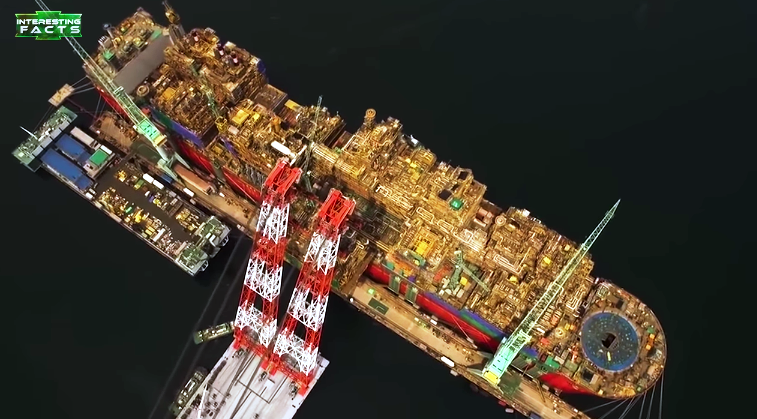 This massive floating rig is sixteen hundred and one feet long and 243 feet wide. It was made with more than 260 thousand tons of steel and fully loaded will displace more than six hundred thousand tons. That is more than five times the displacement of the Nimitz-class aircraft carrier. Samsung Heavy Industries built it at the Geoje shipyard in South Korea. The cost of the vessel was between ten point eight to twelve point six billion US dollars. The critical innovation will allow natural gas to be extracted from wells offshore which will be liquefied and chilled by the floating gas platform. It will be able to produce at least 5.3 million tons of liquefied natural gas per annum. It’s hard to get an idea of just how big this airplane is without seeing it in person. But only one of its wings is the same width as an entire Airbus a320. It’s also double the length of the passenger jet. It was designed and building Ukraine which was part of the Soviet Union in the 1980s by the Antonov corporation. To carry Soviet space shuttles. Even after 27 years of first entering service, it’s still the most extended and most massive operational plane in the world. Following the collapse of the Soviet Union in 1991 and the space program. The operational loan an-225 was placed in storage. The18t turbofan engine puts out 50 1,600 pound-feet of thrust. It utilizes an increased capacity landing gear system with 32 tires and wheels. Some of which are steerable enabling the aircraft to turn around inside a 200-foot runway. It has a maximum takeoff weight of 1 million four hundred and ten thousand nine hundred fifty-eight pounds and can hold forty-six thousand cubic feet of cargo.Recently China has said it wants to develop a modern version of the plane. It will be interesting to see what they design. It is the world’s most extended off-road vehicle. It can move 100 tons of cargo over sand snow and other rough terrains. The TC 497 at 572 feet long had for 1,100 seventy horsepower solar gas turbine engines with a total of four thousand 680 horsepower. These engines spun generators providing electricity to 54 electric motors. One for each set of wheels. That’s a 50 four-wheel-drive vehicle. The Overland train was made up of DC Drive motors planetary systems and switch gearboxes. The US Army engaged RG Letourneau the inventor of five Overland trains of different sizes and for use in different terrains for 3.7 million dollars. In the 1950s to build the TC 497 Overland Train mark 2. The TC 497 was designed to travel overland in a variety of conditions Arctic desert sand as well as rough terrain. 9. Schwerer Gustav 800-millimeter rail cannon. In 1939 Adolf Hitler was trying to figure out how to penetrate the 930-mile defensive wall built by the French. The heavily fortified Maggie new line curb AG a leading German steelworks and armaments manufacturer was approached with a request to provide ballistic data of a 70 centimeter, 80 centimeters and a 100-centimeter caliber weapon. Named after the head of the croupe family. 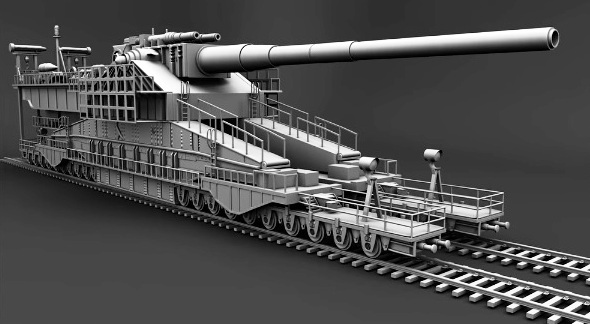 The Gustav gun weighed in at a massive 1344 tons. So massive that even though it was attached to a rail car. It still had to be disassembled before moving. So as not to destroy the twin set of tracks as it passed over. Gustav eventually went to war at the siege of Sevastopol in July 1942. When fully assembled. It would be 141 feet long, 23 feet wide and the axis of the barrel, some 25 feet above the track. A unique four-track section had to be laid to put the gun into action. It used 4.7-ton high-explosive shells useful to a maximum range of 29 miles and also 7-ton concrete piercing shells at a range of 23 miles. Even though it was employed at the siege of Sevastopol in July team 42. Hitler simply went around the Magno line through Belgium. 10. The Terrax Bucyrus Rh 400 the Bucyrus Rh 400. 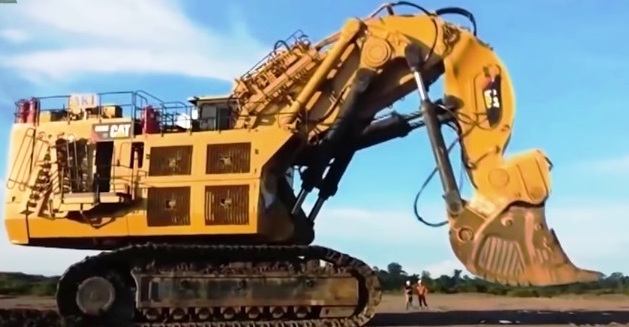 Caterpillar owns this is the world’s biggest hydraulic excavator. It was initially launched by Tareq’s in Germany in 1997. But Bucyrus acquired the mining equipment division of Terrax in 2010. Caterpillar bought Bucyrus in 2011. The Bucyrus Rh 400 weighs approximately 890 tons. The shovel can pick up 45 cubic meters of soil or rock in a single scoop with the bucket itself having a dig depth of seven and a half feet at ground level. The hydraulic excavator is powered by two 16 cylinders 4210 cubic inch diesel engines that have a maximum power output of 4,400 horsepower each the hydraulic system alone uses 2642 gallons of hydraulic fluid. 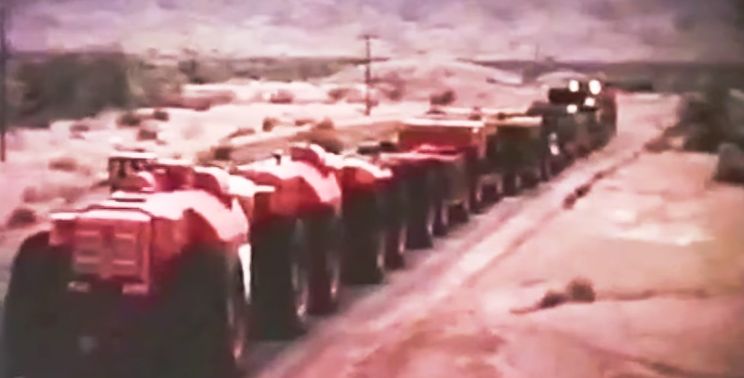 We believe this article on the ten biggest vehicles of all time was useful. Please drop a comment if you have any doubts and please share it on social media to support our team.